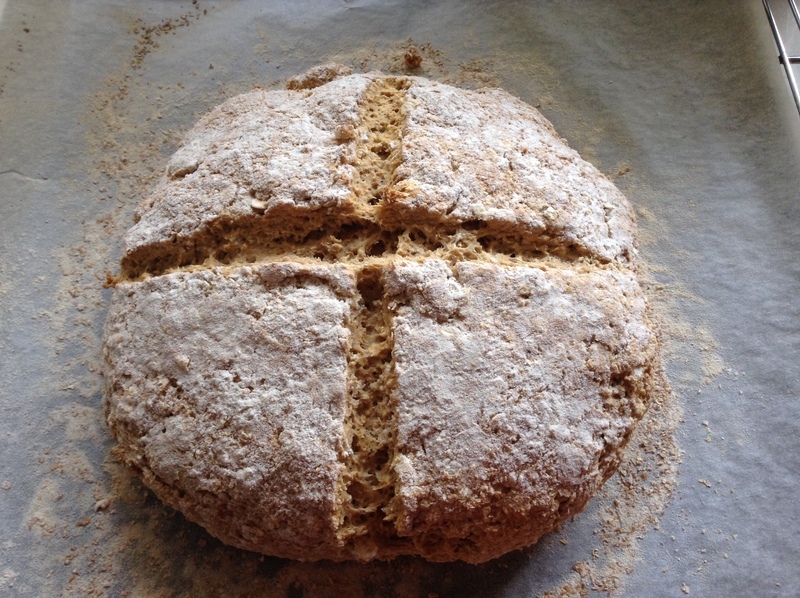 SATURDAY COOKING: RYE SODA BREAD. I have been very slack lately with my blog. Time flies, and in preparation to do some walking in Spain, I have spent a lot of time hiking and not much time doing anything else in my spare time. But I have been baking every week, regularly on a Tuesday morning. This a loaf for 6. Preheat the oven to 190°C. Place both flours, the oats, bicarbonate of soda and salt in a large bowl and mix together. In a separate bowl, whisk the egg and buttermilk or yogurt together, then use a fork to stir the egg mixture into the flour. Once it starts to come together, use your lightly floured clean hands to pat and bring the dough together. Shape the dough into a round ball and place on a lightly floured baking tray, dusting the top lightly with flour, too. Use your hands to flatten the dough into a disc, roughly 3cm deep. Score a cross or star into the top with a knife, about 1/2cm deep, then bake in the centre of the oven for 40 to 45 minutes, or until a firm crust has formed and it sounds hollow when tapped on the bottom. Transfer to a wire cooling rack, and serve slightly warm. I cooked the bread for 45 minutes at 170°C fan forced. Jamie says “this bread is delicious hot from the oven – it requires no proving in the making, and there are lots of wonderful ways to enjoy it”.